NanoLumens will formally make its EMEA market entrance at ISE 2015 with the introduction and demonstration of a front installable, front serviceable 2.5MM LED display at Stand #11-M38 — the NanoSlim Engage. At the same time, the company will showcase its complete line-up of NanoSlim, NanoCurve, and NanoWrap LED display solutions for prospective European customers. NanoSlim Engage is designed to allow customers to engage their audiences up close and personal. The new high resolution, large-scale visualization solution from the industry leader in indoor LED displays comes backed by a corner-to-corner six-year warranty and is designed to serve as a display solution for board rooms, command and control centers, and other areas where clear and up-close viewing is required. It is also the first LED display solution able to be both front installed and front serviced. 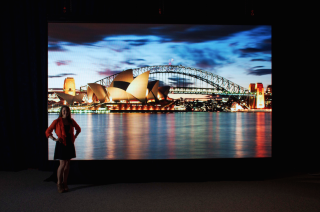 NanoLumens’ formal European market entrance at ISE 2015 comes at a time of growth for the Georgia-based company. Its current clients include a broad range of marketers covering the fields of broadcast, casinos, control rooms, convention centers, DOOH, higher education, hospitality, retail, stadiums, and transportation including AIG, Bally’s, CBS Outdoor, CCTV, Charles Schwab, Delta Airlines, Estee Lauder, GTE Financial, Holt-Renfrew, Invesco, Macy’s, Universal Studios Florida, The Chicago Mercantile Exchange, Uniqlo, and the new World Trade Center Freedom Tower, among many others. Cope said that the company’s strategic partnership with the technology contract manufacturer PartnerTech AB will enable it to continue to scale production as demand for solutions grows. “Because PartnerTech AB operates 13 facilities in six countries, we will be able ship as scheduled,” he emphasized. NanoLumens displays are slim, ultra-lightweight, energy efficient, and feature a bright, seamless, high resolution picture quality that can be viewed from any angle throughout the display horizon without color shift or image distortion. The company’s patented display technology and products promise to engage audiences in every type of higher education, retail, hospitality, stadium, arena, casino, transportation and public event environment.All NanoLumens displays accept input from nearly any device or content management system. There is no need for special software, hardware or special personnel to display content. With a profile of only a few inches, NanoSlim displays can be installed on virtually any surface without being obtrusive. NanoLumens’ patented display technology is optimized for indoor use, operating with virtually zero heat or noise while producing bright, rich, consistent color as well as off-axis viewing with no color shift or image distortion throughout the display horizon.